Hold a Permaculture HOUSE PARTY! the Belili CafePress online store. Permaculture: The Growing Edge is available on Youtube. * Hold a HOUSE PARTY screening - you can now download a poster, a recipe and a set of discussion questions. Take a look at the HOUSE PARTIES page for all the information! Visit our More on Permaculture page for Permaculture definitions, principles and resources. 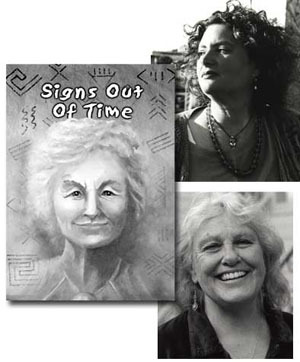 January 2011: Starhawk in an audio interview about the film on kgnu.org. Brilliant researcher on the living biology of soil and sustainable farming, focusing on ways to improve soil health. Founders of the Regenerative Design Institute: Cultivating life skills and deepening awareness of our place on Earth. Through programs and courses, teaching the skills and technology people need to become community leaders and create healthy solutions to the current environmental crisis. Editor of Permaculture Magazine, book publisher and founder of Permanent Publications. Paul Stamets has been a dedicated mycologist for over thirty years. Over this time, he has pioneered countless techniques in the field of edible and medicinal mushroom cultivation. Trained as a tracker since boyhood, Jon Young collaborates globally with organizations and individuals seeking to foster deeper community and nature connections through the power of cultural and coyote mentoring principles. Creating and facilitating prototype gathering spaces that can inspire any community to create their own places of gathering. Today, anyone who loves the earth knows that we face a huge crisis. Climate change, oil spills, toxins and habitat destruction threaten the viability of ecosystems around the world, and damage the life-support systems that we all depend upon. The reality is alarming and sometimes overwhelming. And yet—solutions to our most grave problems do exist. While governments stall and politicians prevaricate, ordinary people around the world are making changes in their lives and trying out new ways of growing food, providing for human needs, and building community. 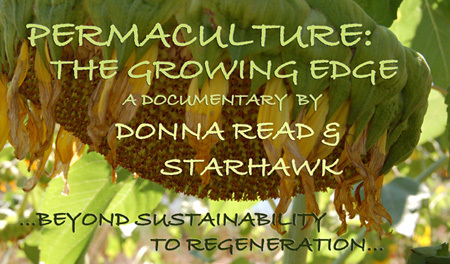 Starhawk practices and teaches the system of ecological design called permaculture. Together, Donna Read and Starhawk wanted to document the positive steps people and taking and the solutions that do exist. We believe that people can face huge changes and make enormous efforts when we feel hopeful, that we are best motivated not by fear and alarm but by vision and love. Permaculture: The Growing Edge is our labor of love, exploring just a few examples of the immensely creative and regenerative ideas that are inspiring people around the globe.